In the backyard on a gorgeous southern California day. 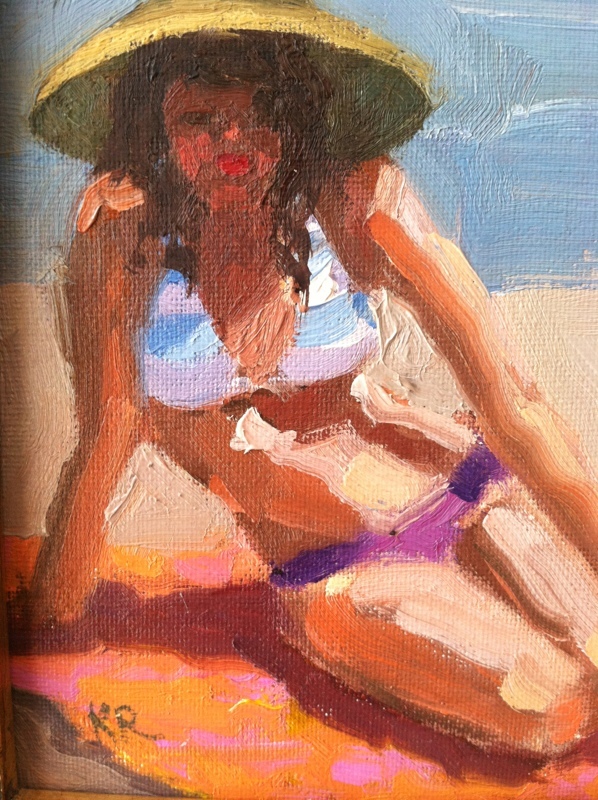 Quick study of girl with straw hat on beach towel. 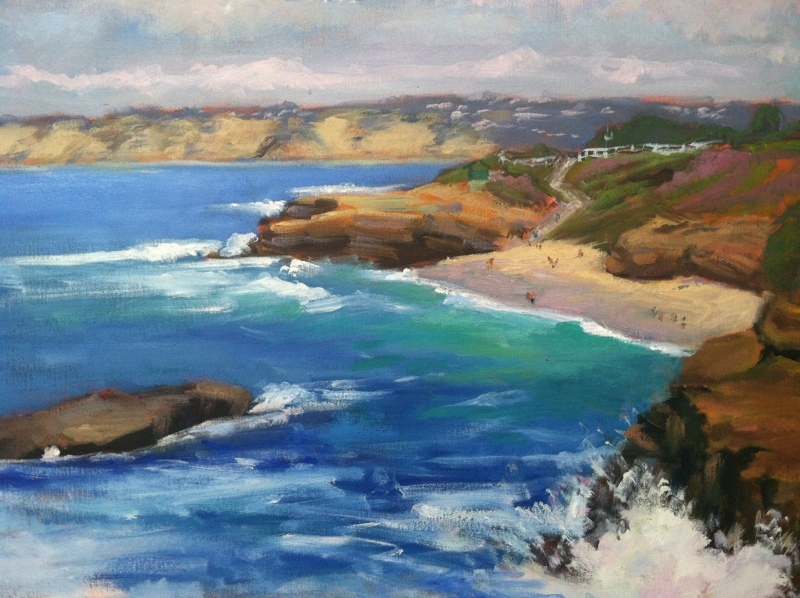 Painted this large piece after some small plein air sketches/studies at La Jolla cove, San Diego. It was a glorious day with pretty clouds in the distance. 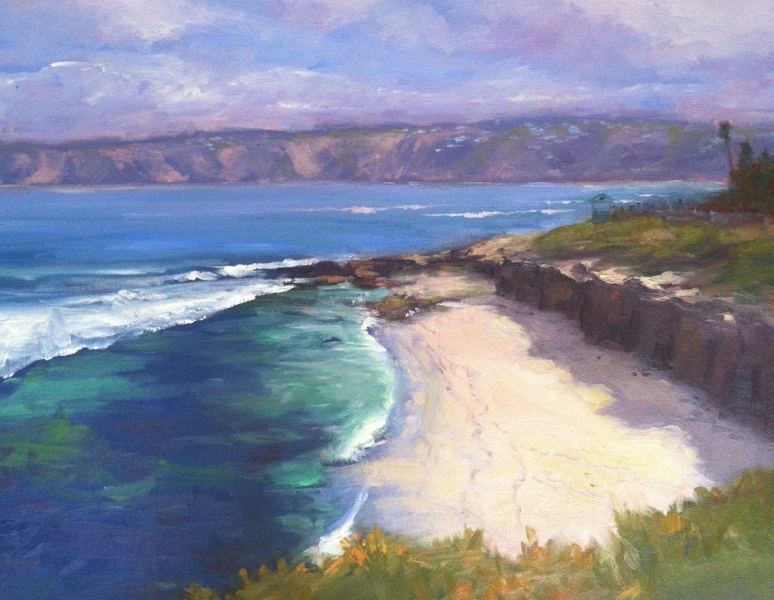 In the studio while painting this I could feel the warm sun and light breeze of that day. Little guy ready to play! 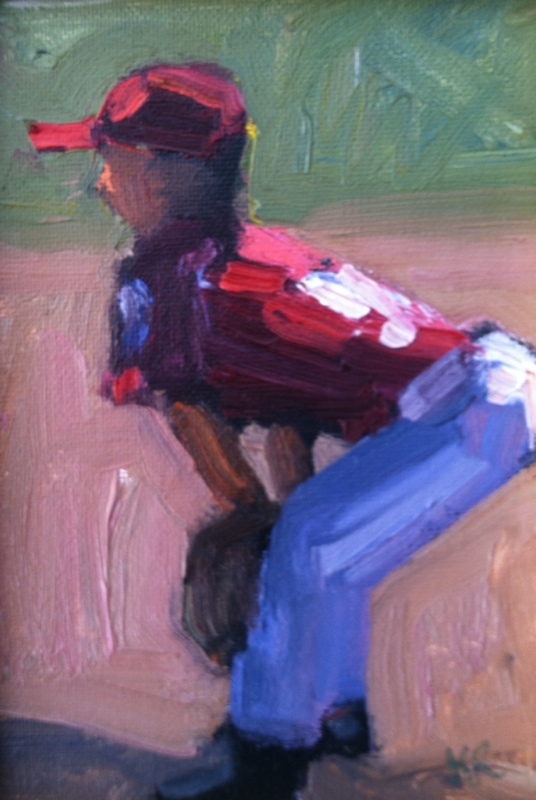 Love the light on him and red uniform. 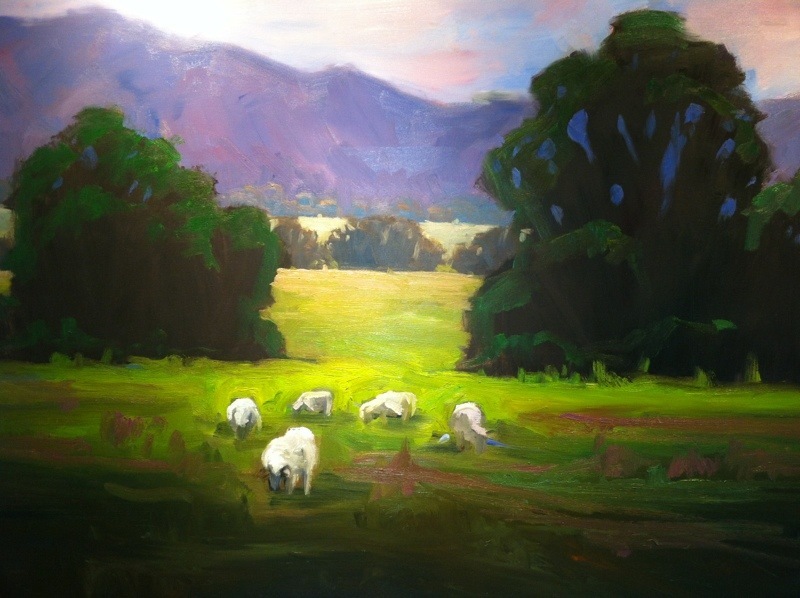 Furry white sheep with legs deep in kelly green grasses inspired this painting. The grey Irish skies make the greens look greener. The countryside is both peaceful and lonely. I exaggerated the mountains a little to give a more dramatic feeling while the sheep graze. Where to Buy Original Artwork for Sale Online? As an artist myself I love to look and see where art is bought and sold online, and while it may be a bit confusing about where to find the best artwork at good prices from trusted merchants, there are a few that I have found that look really good. The problem with buying original artwork online is that it is usually an expensive purchase and it’s hard to know the quality of the painting you are getting. So let me break down a few of the top online destinations for original artwork to enlighten your search. As always, please check out my paintings for sale where you can buy online and I’ll ship right to your door! Ease of Use: The site is clean and simple. You can easily filter down paintings by nearly every possible element: size, price, medium, artist, color, etc. User friendly to the max. Variety: Ugallery has the whole spectrum covered. 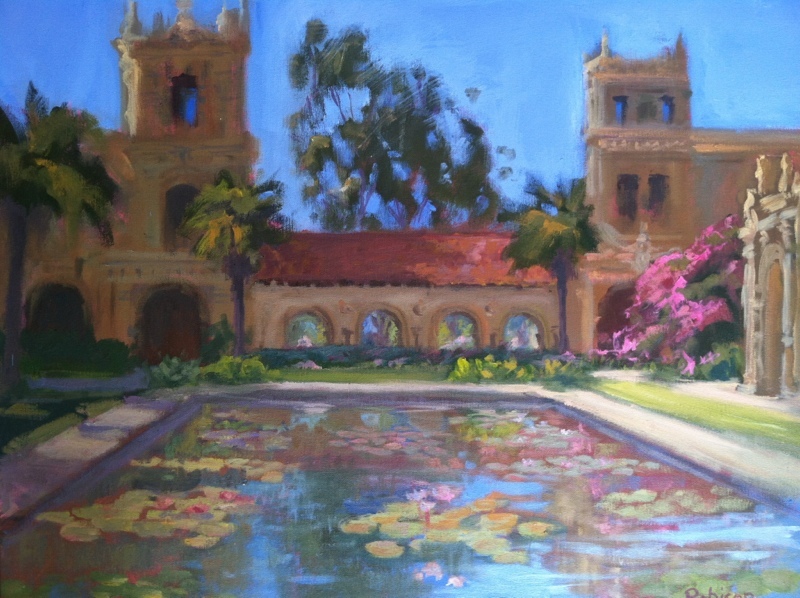 They have every fine art medium from paintings to sculptures, photography, prints, and more. They have every size, color, and price range imaginable. Think of it as the Amazon of art. Quality of Work: Very high quality. 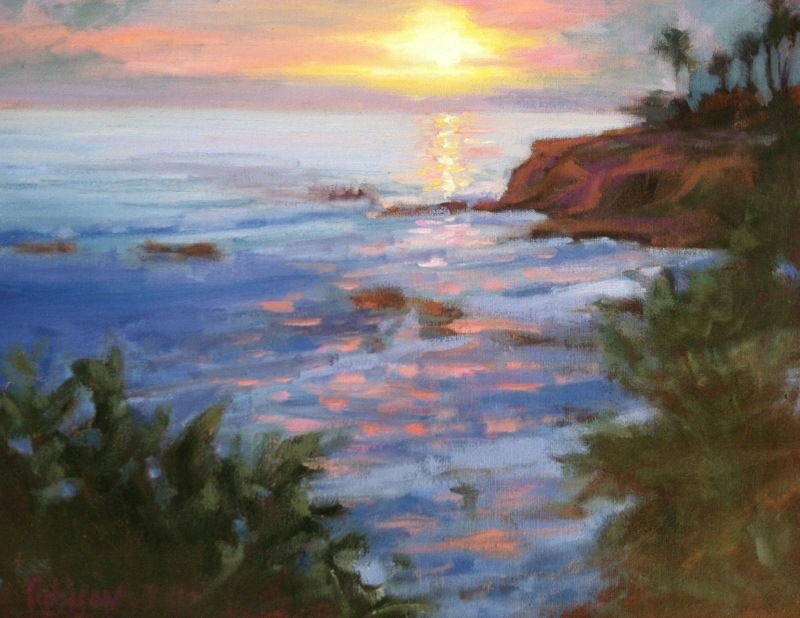 Every painting is juried by Ugallery staff. Return Policy: 7-Day no-risk return policy. They pay return shipping. Test Artwork in Home: Yes, try it in your home for 7 days. They will pay for return shipping if you don’t want to buy it. Ugallery.com works closely with artists to ensure that the artist, seller and buyer all benefit. They claim that 70% of their artists sell and they give artists many tools to promote their art. They have a daily deal email that goes out every day, where one piece of art is discounted at 50% off. Definitely one of the top destinations for quality original artwork. Ease of Use: It’s a little difficult to find art, since it’s hidden under Home & Garden strangely. There’s also not many filters to sort through different types of art besides the medium, so you’re looking at a random assortment within each medium for the most part. Variety: There’s a wide assortment, from collages to paintings to figurines & art objects. It’s hard to separate what’s original and what’s not unless you pay attention to the description or only look in the Originals category. Quality of Work: The quality ranges from amateurish to semi-pro. Not too many high-profile artists on here, but some good mid range ones. There’s a large emphasis on vintage art, so a great place to find rare pieces. Return Policy: You have to look at each individual Shop Policy to find their terms for refunds. This makes it a little murky, but most shop owners are eager to work with you. Test Artwork in Home: Varies by shop. Contact the shop owner for details or read their Shop Policy. Designer Discount: Depends on each shop. Some may give discounts to designers who buy in volume. Pricing: All over the place. From $5 small originals to $16,000 Picassos. Ease of Use: Average. There are tons and tons of filters, so it takes a little while to find exactly what you want. Variety: eBay has every type of artwork imaginable from oil paintings to stuff that you probably wouldn’t consider art. Quality of Work: Ranges from extremely amateurish to Picassos. Return Policy: Varies by seller. Make sure to pay close attention to the details of each item, you don’t want to make a mistake here. Test Painting in Home: Again, varies by seller. Most offer a 14-30 day return policy, with the buyer paying return shipping. eBay also offers buyer protection to cover the return costs and shipping if there is a discrepancy between what’s advertised and what you get. Designer Discount: No general designer discount, but you might work one out with the seller. eBay is almost the wild west of art. Almost anything can be listed at any price by anyone. The quality and authenticity varies by seller. You can find some really good deals from up and coming artists or hidden auctions, so it’s a gold mine for treasure hunters. For those who are limited by time and want to ensure the best quality, eBay may take too much time. For those that love the thrill of the hunt and looking for good bargains without too many limitations. Pricing: $25-$8,000+ Plus free shipping in the U.S. or $8 international. Ease of Use: Zatista is very friendly for the buyer looking for original art since, like Ugallery, they specialize in it. Variety: The site is dominantly focused towards original paintings, with photographs coming in at a distant second place. There are a few other types such as mixed media and drawings as well, but not nearly as much as paintings. 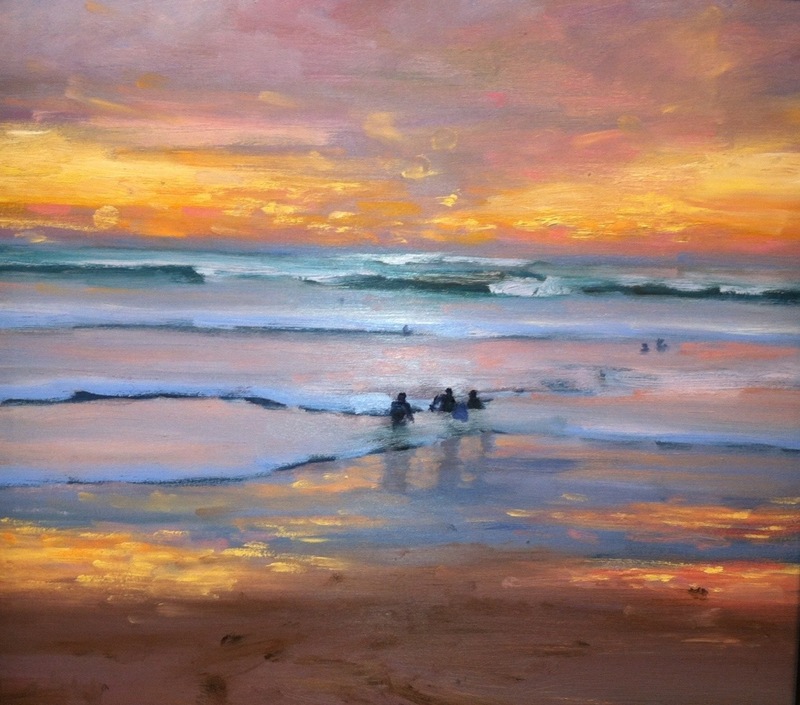 Within each type there are a variety of mediums such as oil, acrylic, and watercolor in paintings. Each type and medium has a wide range of styles of work as well, so there is a bounty to choose from. Quality of Work: Zatista is very scrutinous and make it clear that they only accept original work. All Artists and Galleries must be reviewed and approved by Zatista’s Art Review Board. Each and every work of art on Zatista is 100% unique, 100% original. Return Policy: Returns are easy at Zatista with free shipping both ways. They don’t seem to have a clear limit on the number of days you have to return your bought piece, so you can buy with confidence as all of the work is 100% guaranteed. Test Painting in Home: They don’t have a program set up to test the paintings, but since it’s free shipping both ways within the United States, they make it easy to test it in your home for a few days and send it back if you don’t like it. Designer Discount: Zatista does not seem to offer an apparent designer discount. You can contact them directly to request one. Designers will get a dedicated account manager to help them with their purchases, however. Pricing: $5-$100,000+. This is such a broad category and artists prices are all over the place, that it depends on the artist. Ease of Use: Unfortunately, a lot of artists’ personal websites are very rudimentary, and there are very few that you can actually purchase art from directly. 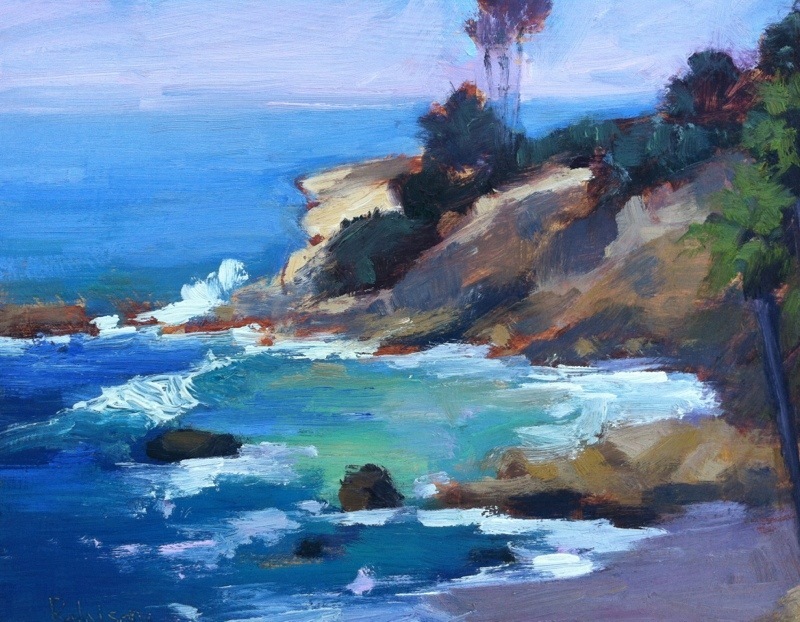 Most artist websites are just for displaying their work with the hope you will visit their gallery or give them a call. We see artist websites getting better as more and more people feel comfortable purchasing expensive works online, but currently the big websites listed above provide a much better customer experience when buying art. Variety: The variety runs the gamut. All types of artists in all fields have personal art websites, some better than others. On the individual artist’s website, however, there will be little variety in terms of the medium of works. Quality of Work: Most artists who take the time to create their own website are invested in the process and see themselves as professionals, so you will generally see higher quality work on the artist’s website than you would see generally on eBay or Etsy, where there are more beginning artists. Return Policy: This varies widely. Generally, artists want to have a good relationship with their customers so they will work with you if you have a problem with the painting. Talk to the artist first to make it clear before you make the purchase, or read their return policy thoroughly on their site. Test Painting in Home: A lot of artists will allow you to test out the painting or art piece in your home, though this is less likely if you live far away from the artist or in another country. It works best with local artists that you can meet because artists are less willing to ship their work for a test when they don’t have much legal protection. Designer Discount: When selling multiple paintings or when trying to forge a relationship with a designer, artists will often give discounts. Again, this depends widely on the artist themselves so talk to your favorite artist first. Art.sy is a brand new site that promises to take online art buying to a new level. Making original art accessible to anyone with an internet connection. Art.sy is powered by The Art Genome Project®, an ongoing study of the characteristics that distinguish and connect works of art – similar to the Music Genome Project that powers Pandora.com. The site is invite-only at this point and still in the beta stage, so be on the lookout for this one soon. 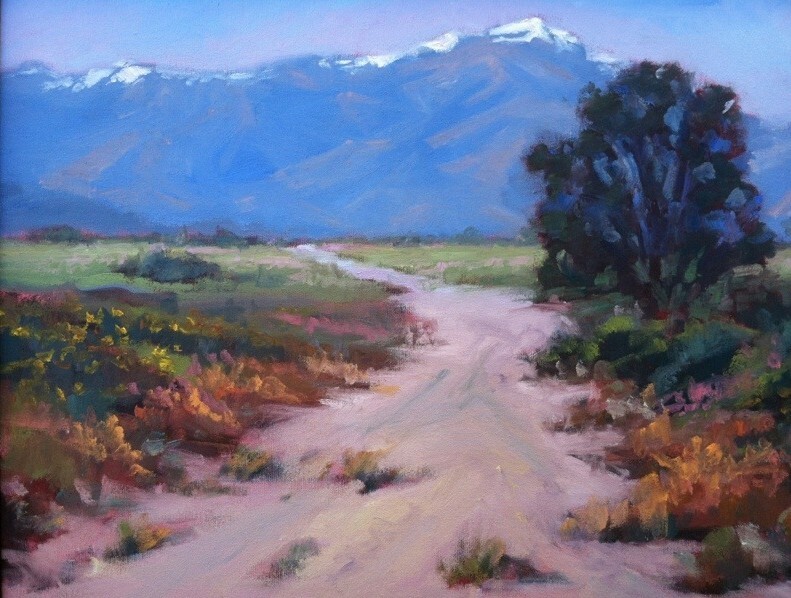 Hunting for a good location to paint out near Palm Desert, I found this snow capped mountain with wild flowers in the foreground. When I look at this finished painting I can still feel how cold it was that day. 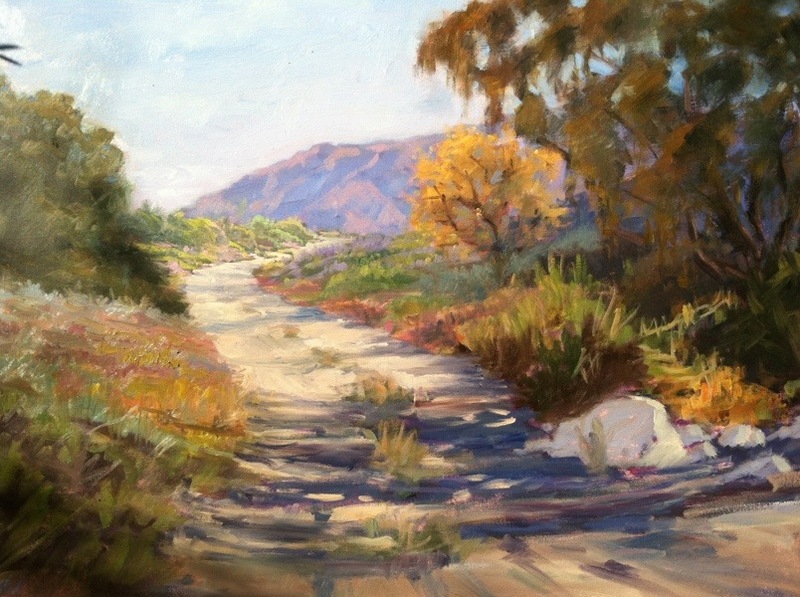 It was important to capture the light and shadows on the path of this desert scene. I found this tree along this path and thought it was beautiful to paint …..these eucalyptus are all over southern California. On location at Heisler Park, Laguna, California. 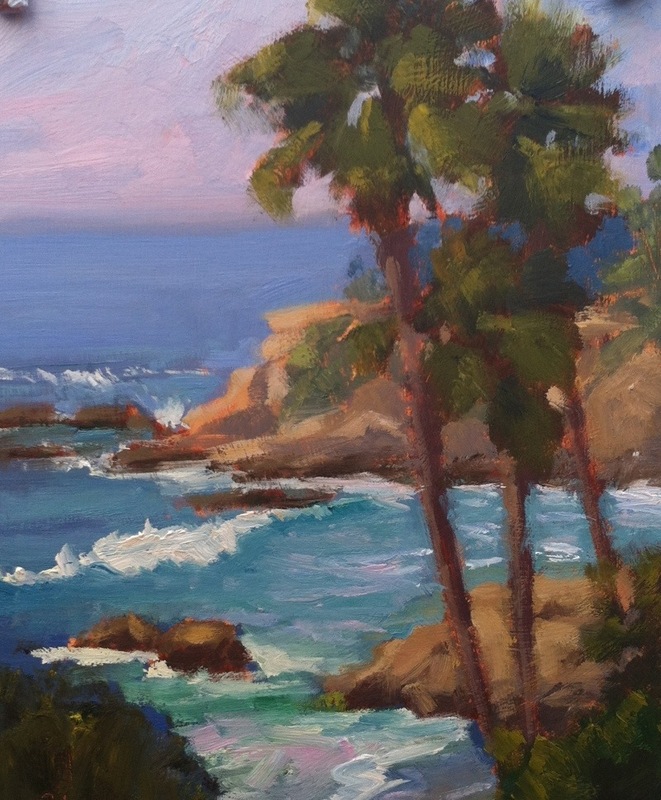 Gorgeous weather to be painting outside in Laguna. The park has new stairs and walkways which make it easy and accessible to all. The views are spectacular. 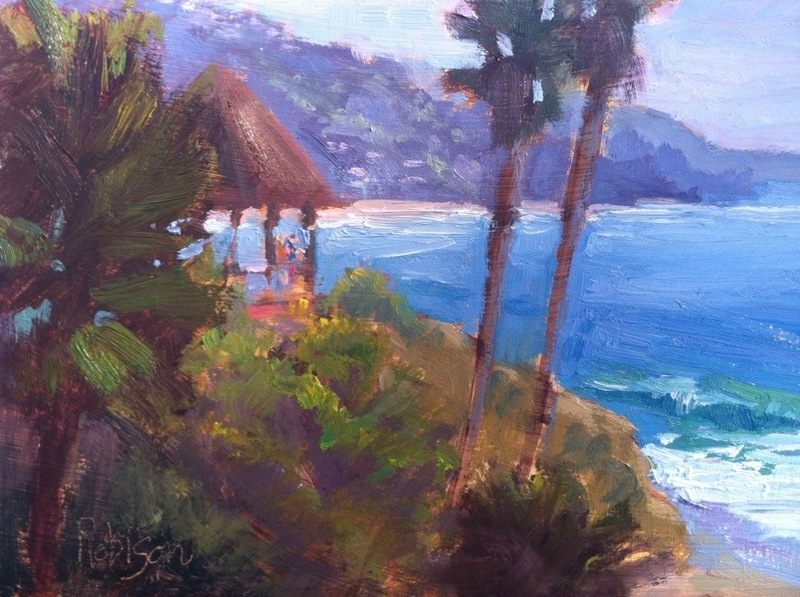 View of gazebo at Heisler Park, Laguna. 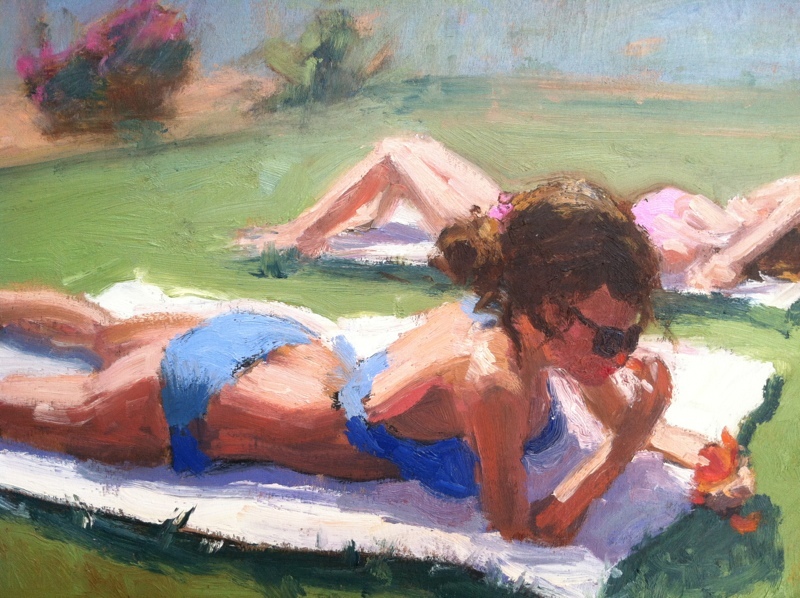 I painting this on location, plein-air, that’s outdoor painting in French. Lots of weddings take place at this gazebo overlooking the beautiful lagoons below. 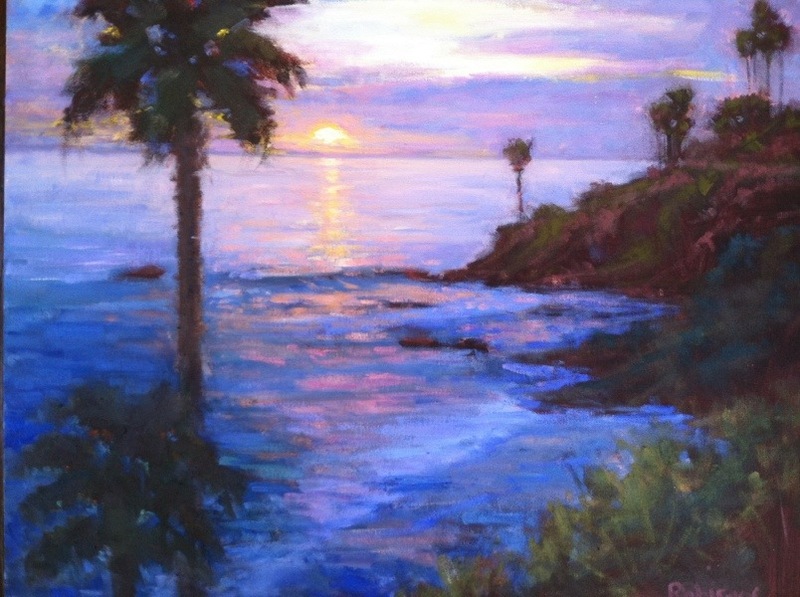 Painted this on location at Heisler Park, Laguna Beach. Gorgeous day to be out painting, light breeze and lots of friendly people stoping to talk. Watching my son surfing at a distance I captured the sillouetted figures against an intense sunset. I feel I captured the awesome peace of the ocean and how small us humans are in the massive ocean. I love this time of day. It is relaxing and peaceful, reminding us to start slowing down for the evening. Gorgeous view of beach from Crystal Cove parking lot. 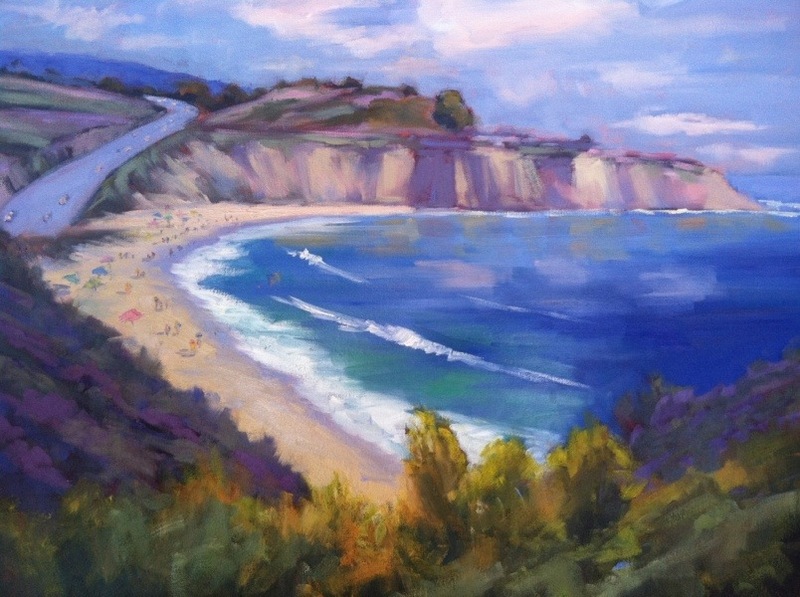 I painted a few small plein air paintings in this location and used them to create this larger 24×30. 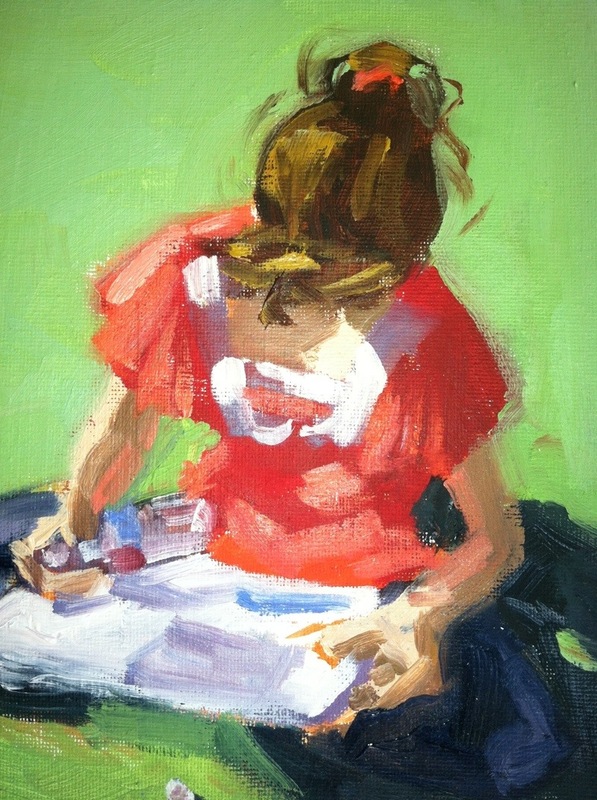 Did quick sketch of daughter reading newspaper while waiting at a soccer tournament. 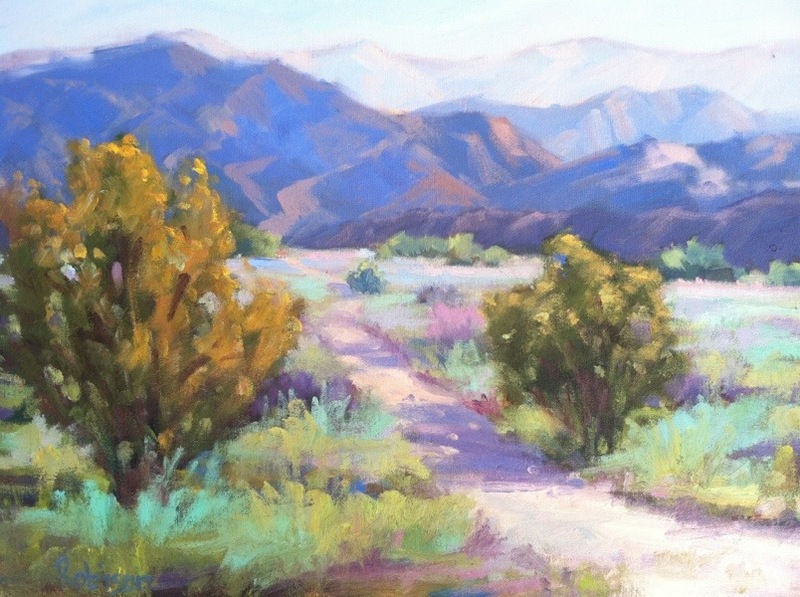 This was painted out near La Quinta, Ca. A favorite hiking place when we visit relatives in La Quinta. A better title would be “Tumbleweed someday”. These bushes have such a soft appearance visually but they are thorny to touch. Laguna Beach, Ca. Sunsets are gorgeous colors. Just as the sun is setting the white water looks periwinkle blue. It’s a good time of day to go out and meditate in nature. I love how the desert light on the foliage makes a blanket of pale colors. 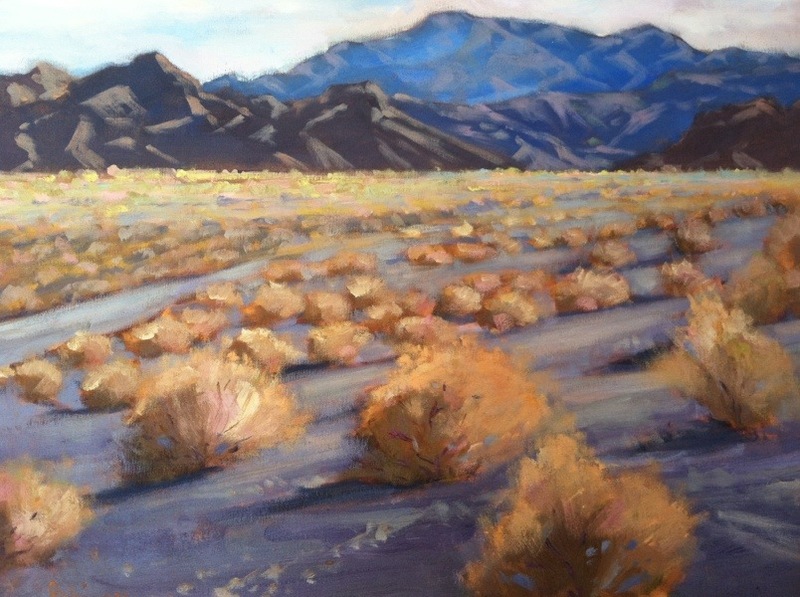 This painting is out near Palm Desert.